Oregon’s GMO labeling Measure 92 has gone through multiple vote-counts before an outcome could be determined. But now after a full-vote and recount, the decision is final: Oregon’s GMO labeling effort will not go forward. This is sad news from Oregon, though the fact that the “Yes” to GMO labelling campaign came so close to winning in spite of being massively outspent by the opposition is an extraordinary achievement. Yes on 92 campaign says there are no legal options remaining that could lead them to victory but labelling movement will continue to grow. “After looking at the facts about Measure 92, Oregon voters decided that it rightly deserved a no vote,” Pat McCormick, a spokesman for the No on 92 Coalition, said in a statement. A judge on Tuesday rejected the campaign’s request for a temporary injunction preventing the certification of the recount results. The campaign was the most expensive in Oregon history with combined spending of nearly $30 million, with proponents being backed primarily by natural food companies and advocates. The opposition campaign was funded by agricultural companies and food manufacturers. Similarly, just take a look at the spending breakdown from key GMO labeling initiative Prop 37 in California.’It’s amazing how far we come when this is what we’re up against. Though even with this unfortunate loss, there is no question that we are becoming ever closer to achieving the right to truly know what’s in our food. Despite biotech spending millions of dollars to sway the public (and having ties with political leaders), our collective voice is growing stronger every year. This is a sad news 🙁 We need to boycott those big corporation’s products. Why don’t we just Ban GMOs? They’ve been banned in other countries. How did they convince the public to vote to ban GMO’s? They didn’t vote. Their government cares more about the people and the environment than the all mighty dollar! This just goes to show everyone how Corrupt the U.S. Government. People don’t count for anything. It’s all about the money from fellow Corrupt Corporations. The U.S. Government IS Monsanto and all the other Satanic Corporations. 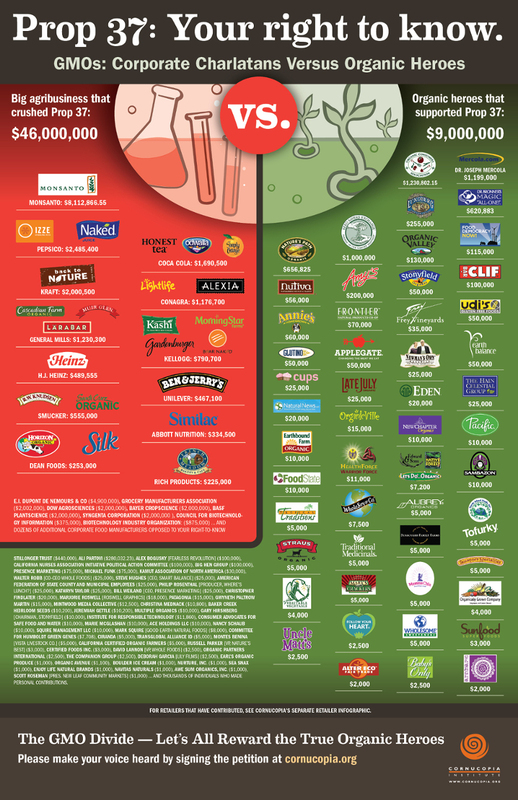 Voluntary labeling by the companies that do not use GMO’s should go a good way to sorting the issue. If those that don’t use GMOs label their products as GMO free then folks can choose to buy those if they want to. The products with GMO’s in them cannot say GMO free, surely. GMO and non-GMO crops can’t exist together. Eventually w/gene drift they will all be contaminated! It is time to stop wasting what little time we have on labeling. It is nonsense! BAN GMOS NOW!